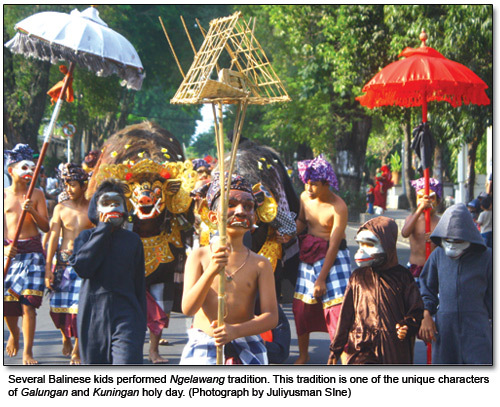 A week ago, Balinese Hindus had celebrated the Galungan holy day. As mentioned previously, there are several ceremonies following the series of Galungan. One of the other great holydays is Kuningan. Kuningan is held ten days after Galungan, precisely on Saturday. On Balinese calendar, Kuningan falls on Saniscara Kliwon Kuningan. Kuningan is celebrated to show gratitude to the God. Balinese Hindus believe that this is the day when God with all of the manifestation is on earth, to give blessings to human beings. Besides, this day also believed to be the best day to show gratitude to the ancestors. On this day, Balinese cook yellow rice as the offerings to show gratitude to God for all of the blessing and the rich natural sources. On this day, Balinese also make special ornaments which are only made on Kuningan day. It is called tamiang and endongan. Tamiang is made from coconut leaf, and it is hanged in every top corner of the house and buildings in the yard. Tamiang is made as symbol to prevent bad things or evil that may comes into the house. Besides, tamiang also symbol of the nature. Through tamiang, human being is reminded to be always taking care of the nature. So human will not be crushed by the law of the nature. Endongan is another special offering on Kuningan day, which means supplies. But in this case, the supplies are not in the shape of material. Balinese believe that in this life, the best supplies are knowledge, devotion and clear mind. Endongan is about how to keep the harmonization with the surrounding, whether with the other people or society, and also with the environment. On Kuningan holy day, the ceremony should not be held pass over midday, because it is believed that God return to heaven after the midday. One of the most interesting rituals by the society on Galungan and Kuningan holy day is the tradition of Ngelawang. Ngelawang is a unique tradition in Bali that is held by performing Barong dance on the street, and mostly only can be found in Galungan and Kuningan celebration. This tradition can be found almost in all villages around Bali. The tradition is believed already exists since tens of years ago from generation to generation. By holding Ngelawang tradition, Balinese believe that it is meaningful to neutralize bad spirits around human’s life and environment, including preventing any kind of disease and all bad things that will disturb Bali. Ngelawang is performed by several adults or even kids by having tour around the village. The name of Ngelawang came from the words ‘lawang’, which means ‘door’, so generally ngelawang means a performance that performed by moving to one place to other place or from one village to another. Nowadays, ngelawang is not merely performed by grown up people, children in Bali now begin to explore their creativity by also performing ngelawang on the street. At sometime, their performance even attracts more viewers. The performance in Ngelawang using sacred barong performed by grown up people is held by taking the barong around the village and performing the barong dance when they passing a temple. Meanwhile the one that is held by children is an entertainment and they will perform the dance when someone gives any offering and donation to them when walking around the village.